Vaping Views: Valentine's Contest & Give-Aways! 14 Days of Give-Aways, Including our Beautiful New E-Cigarette Case! You've heard of the 12 days of Christmas, right? Well Vaping Vamps is introducing "The 14 Days of Valentine's" and YOU could be a lucky winner! 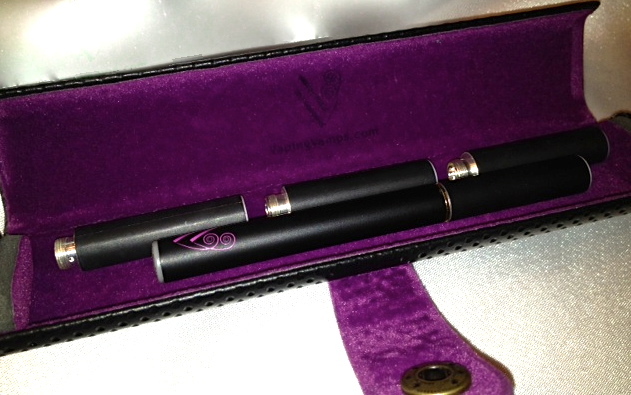 Every day from Feb. 1 - 13, we'll be giving away a beautiful new e-cigarette case or $10 off any e-cigarette starter kit. And on Valentine's Day, one lucky woman will receive two Deluxe E-Cigarette Starter Kits and two e-cigarette cases: one for herself, and one for someone she cares about. You must be a friend of Vaping Vamps on Facebook. Post a photo or video on our Facebook page, telling us what you love about vaping or why you want to switch to vaping. Tag yourself. You must also be signed up on our VIP mailing list. We will select one winner a day (13 all told) between Feb. 1 and Feb. 13. If no one posts a photo or video, there will not be a winner that day. The winner on Feb. 14 will be chosen from among the women who posted photos/videos on Facebook from Feb. 1 through midnight on Feb. 13. We believe that every woman who switches from smoking to vaping is a winner. Enter to win TODAY. Good luck and we hope you'll be a winner! We just got these cases in mid-January, and we've already shipped them to women in a dozen different countries all over the world. What About a National Vaping Day?